*So… this was not originally going to be how today’s episode developed, and the inspiration for it is a bit sad as the passing of Gene Wilder implanted this and other things in my brain yesterday… but, oddly and perhaps appropriately, I think the result is way better than my original idea for today’s dialog… and I hope it is a fitting tribute in my own inferior way to someone who has left a huge imprint on the world he left behind. As has been the case far too many times this year, I find myself inspired to work in a homage in an unanticipated way because of a sad loss… and it simultaneously makes my work a whole lot better than it would have been originally, while making me a little sad and feeling unworthy to take the full credit for the result. Convention sketches are like a box of chocolates… you never know what you’re gonna get! 🙂 With my humble apologies to Forrest Gump, begins the tale of a convention sketch from last weekend at the Raleigh Comic Book Show. Once I was settled in and had said my hellos to fellow guests and the show organizer, I decided to begin a convention sketch on a blank 7×10 comic backing board. Admittedly, I wasn’t sure what I wanted to draw when I began, but since I had drawn a Spider-Man last December I was at least not going to do that. So, pencil to paper and at some point I decided I wanted to draw Batman. 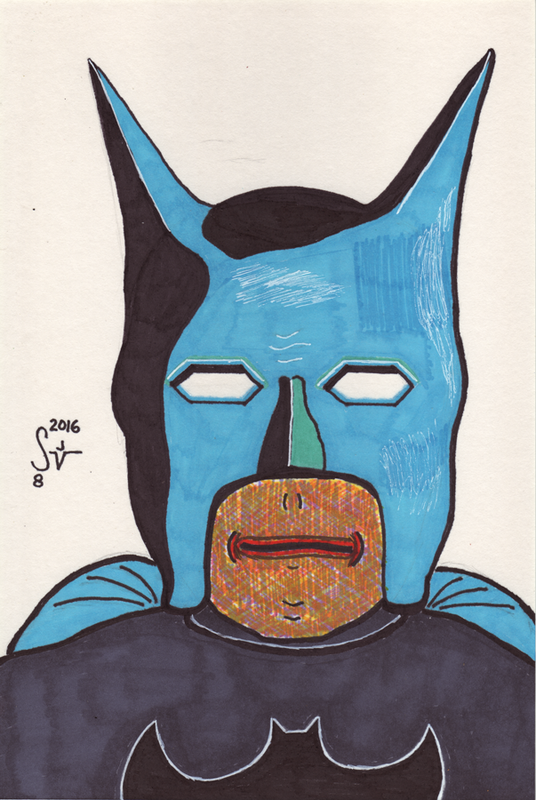 Had I decided to draw Batman sooner, it would have started out looking less like Orion from the New Gods! I realized I had a little bit of work to do to bring it back to being a Batman drawing and not Orion. Nothing against Orion, incidentally, and I probably should draw him too… but I was going for a more immediately recognizable character for this unsolicited sketch and I figured more people would recognize Batman. I think I managed to save it… but you can be the judge! Oh, and in case you wonder… I found myself without proper flesh-coloring markers so I improvised with a few different colors and going for the patchwork illusion of skin tone through color overload! It just didn’t look right leaving his face white once I had colored everything else. So, my least favorite part of this one is the faux flesh tone result here, even though the illusion works from a distance… it just doesn’t hold up quite as well to up-close scrutiny. Remember, if you’d like an original commission by me or would like to hire me as an Illustrator, please use the Contact page and let me know as much as you can about your request.